Swimmer Jessica Harper – hoping to represent Great Britain at the 2016 Paralympics – is celebrating after achieving four A grades in her A Levels. 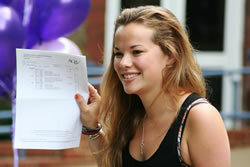 The 18-year-old Putney High School pupil scooped all As despite combining her studies with demanding training sessions. Jess has juggled her studies in English, French, Spanish and History with no less than nine training sessions each week to achieve a world ranking of 16th in the 100 metres butterfly disability event. She is now heading to the USA’s Brown University, Rhode Island, from where she will compete in disability swimming meets across the USA and Canada as she bids for a place in Team GB’s Paralympics squad for Rio. A role model for the next generation, Jess has also been selected for the London Youth Sports Inspiration Project. At Putney 63 per cent of all A Level entries achieved A* or A grades. 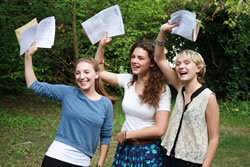 Of the 68 girls who sat A Levels at Putney this summer, more than one third earned A*s or As in three or more subjects. Amongst those celebrating is Jazz Adamson, off to the University of Oxford to study English. Four Putney students are embarking on degrees in Medicine while Ariane Van Hoof will be studying at the prestigious Royal Academy of Music. The most popular university this year is Bristol, followed by UCL and Imperial College London. Some 93 per cent of entries achieved A* - B grades. Subjects with 100 per cent A* or A grades include Latin and Music. Ninety two per cent of History results were at A* or A, with 91 per cent for both English and Spanish and 90 per cent for Psychology. Furthermore, every entry for the Extended Project qualification – much valued by universities - achieved an A*or A grade.